Colegio El Pinar has a canteen managed under the highest quality standards. The service, different from ‘cold style’ canteens that serve pre-cooked or catering food- is based on daily cooked foods, provided on their peak of freshness by our suppliers. The service is supervised at all times, by a company that follows up very closely the quality of our products as well as the health control. Our menu is based on a complete and balanced diet, that provides students with all the nutrients they need for optimal performance. At the beginning of every month we post in our website a planning with daily menus that will be served at school from day 1 to 31. 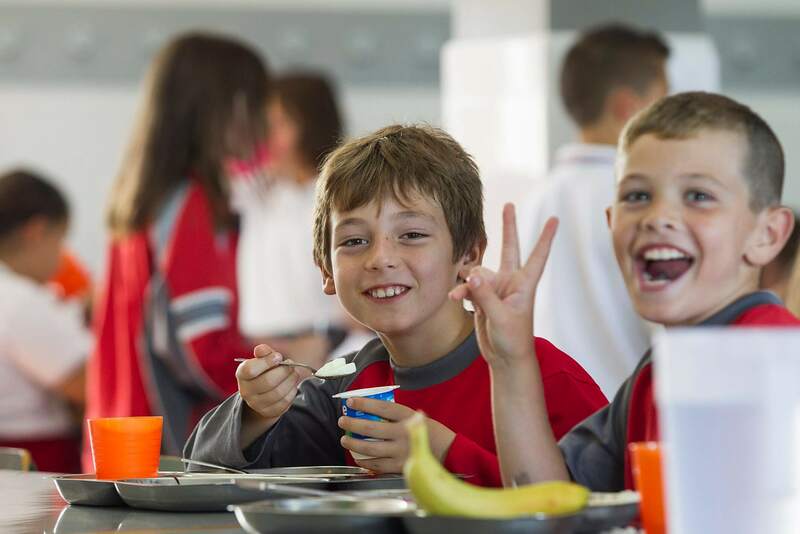 This menu is shared with the families via e-mail, so they are informed about the diet at school and can prepare the rest of the meals of the day accordingly. Annual service canteen. Suscription for the academic year, from September to June (inclusided). To be paid monthly along with the schooling payment. Individual tickets. A maximum of two per week will be accepted. P-LUNCH (Packed lunch from home). The students of ESO are allowed to bring their own food from home. The canteen offers a specific space for it with a monitoring system to check on the food they children bring. This service is to be paid monthly with schooling payment. Individual tickets are not available. Family lunch: Parents of our students can use the service from 2:30 pm to 3:30 pm. They just need to notify the Secretariat by phone or e-mail, and to buy the ticket in the morning. The daily menu won’t be modified, unless it is required after medical conditions or religious reasons. In this case it shall be notified too to the Secretariat. Managing and checking on feeding. Teaching good manners and hygiene habits. Creating a pleasant ambiance, by promoting respect, communication and conviviality. Knowing the specific diets of our students, as their intolerances and food allergies. Encouraging to eat a variety of foods. Fostering body esteem and health care through food. Helping students to a healthy lifestyle. Posture and hygiene at the table, washing hands before eating, seating properly during the meal, using the napkin, not picking food up with the hands, keeping the hands on the table , etc. Correct use of cutlery: teaching how to use the cutlery (holding it properly, cutting food with fork and knife, using the right piece of cutlery). Encouraging to try new foods. Creating a friendly and relaxed atmosphere during meals. This academic year we start a new program called ‘Menús temáticos del colegio El Pinar’‘ (El Pinar’ Themed menus). Each day, our school will celebrate the culture of foreing countries by serving their traditional foods.